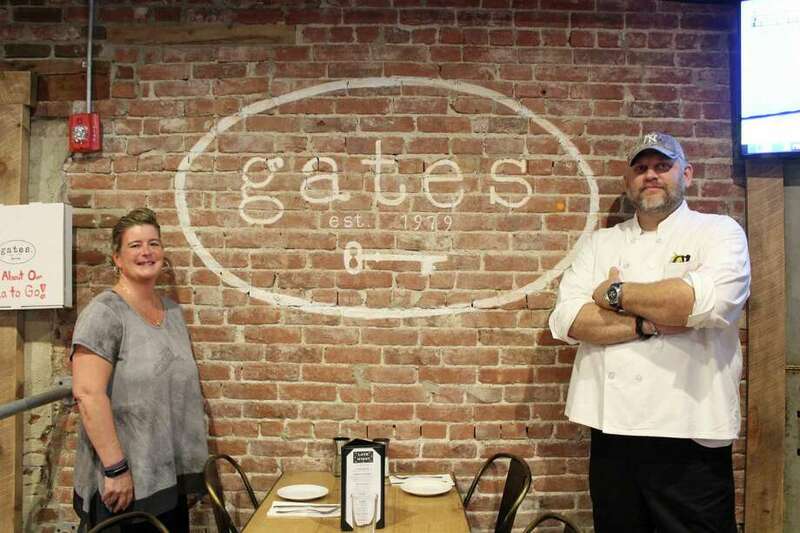 From left, Sheila McGinnity and Nathan Kramer, new manager and chef, respectively, at Gates Restaurant. NEW CANAAN — A downtown landmark, Gates Restaurant is under new management, chef included. Manager Sheila McGinnity and Chef Nathan Kramer joined the New Canaan restaurant at 10 Forest St. in the past few months and are planning to bring new things to this traditional locale. “People have always known Gates as a staple of town and we want to bring those values back,” McGinnity said. In 2016, Gates was sold to a private restaurant group, was remodeled and reopened shortly after. Both McGinnity and Kramer have been, in a way, self-taught, garnering experience throughout their years in the industry from mentors and different roles. Gates Restaurant will take 20% off all regularly priced food purchases (including take-out) for Fire Fighters, Police Officers, EMS, Veterans, Military Personnel, Board of Education and Town Employees. Must have valid ID. McGinnity, who has been in the restaurant industry for over 20 years, started working when she was only 13 at a neighbor’s pizza parlor and liquor store. Originally from Long Island, Kramer knew he wanted to dedicate the rest of his life to being a chef when he was around 17 years old. Though he started out in some small restaurants in Long Island, he owes his learning to another chef, Glenn Thomas, while he was in Avon, Conn.
During his time there, Kramer realized that he could handle the pressure of the job including putting out orders and keeping tabs of different dishes all at one time. For Kramer’s new stint in New Canaan, it’s about keeping classic dishes on the menu but also innovating and experimenting. McGinnity and Kramer said they were looking forward to the coming weeks, pointing out the restaurant was more of a fall and winter season establishment. McGinnity said she was excited for a new opportunity in New Canaan and that though it’s a tough industry, there’s always something to experiment with and innovate. Kramer, from the kitchen side, agreed. “In this business, you definitely can’t just sit still, you have to be aggressive and try different things,” Kramer said.